Moths are a greater threat to our homes than you might think. Indian meal moths contaminate our food, while cloth moths eat our best cloths. Before your moth problem becomes an infestation, give Harris Pest Control a call for a free moth inspection! WHY CHOOSE HARRIS FOR MOTH CONTROL? At Harris Pest Control, we have been protecting homes in Florence, Darlington, Kingstree, Lake City, Hartsville, and Bishopville since 1973. Thanks to these 45+ years of experience, we have been able to perfect our method of moth extermination, prevention, and protection in the Pee Dee region of South Carolina. Have you seen moths swarming about your pantry? If so, you likely have a case of Indian meal moths. They lay their eggs in pantry products such as cereals, grains, dried fruit, dry pet foods, bird seed, pasta, flour, and chocolate. The larva will then eat your pantry products. For this reason, they are also known as pantry moths. Rather than food damage, perhaps you've noticed holes in your clothing? In that case, you likely have clothes moths. These insects tend to prefer dark, undisturbed areas of the house where you keep any cotton, linen, silk, wool fabrics or furs. If left untreated, they will continue to destroy your belongings. When you call us, one of our pest control experts will come to your home or business and offer you a free moth inspection. He will examine your home and property and then design a pest control plan catered to your specific needs completely free of charge. When Harris treats for moths, we implement a treatment process that has been perfected over our 45 years of existence. Our approach is scientific, thorough, and effective. We use a multi-pronged approach to eliminate all traces of moths. 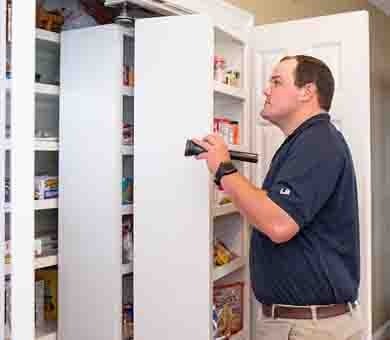 First, all contaminated foods must be removed and pantry shelves vacuumed. Then we apply treatments to eliminate the moths and their larva. We are proud to provide a 30-day guarantee for single treatments. We will keep coming back until the problem is solved--with no additional fees. That's our guarantee.